Bob Smock Jr. was born and raised in Grayling, Michigan. A native with a true sense of adventure, he confesses that the real reason he lives here is the fly-fishing and bow hunting. His wife, Kate, having survived the social and cultural deprivation of the area, has grown to love the rivers, streams and lakes nearly as much as Bob. Bob Jr's father, Bob Sr., was the real inspiration in his life teaching him how to fly fish and bow hunt at an early age. Having the great privilege of fly-fishing and bow hunting with the famed Fred Bear helped seal the notion that Grayling was a pretty special place. With a true love of teaching others as well as sharing this beautiful Northern Michigan area, Bob believes there is an adventure here for the beginner as well as the seasoned pro. Set your sights North and spend a day on the river with Bob. You will have a great time fishing and plenty of memories to cherish. The Old Au Sable Boat Company offers fly fishing guide services on the Au Sable, Manistee, Big Creek & Sturgeon river systems. Trips include a shoreline lunch with beverages and are typically six to eight hours in duration. 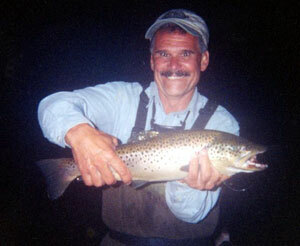 We fish with beginners as well as intermediate and expert fly fisherman. And of course we love trips with young ones. Teaching the next generation the treasures of fly fishing is something we truly enjoy. We are open to your suggestions on the type and size of the trout you'd like to fish for, and have different techniques for different types of weather. If it is a trophy you seek we will happily take you to the appropriate water where bigger trout are known to live. Bob remains committed to fishing the entire river system and adds new Northern Michigan rivers to his guide service each year. 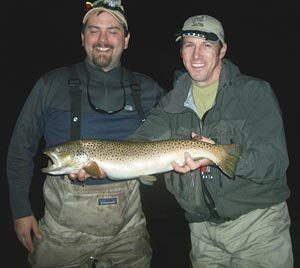 For a truly unique and quality fly-fishing experience, contact Bob at rcsmock@live.com or call (989) 350-7929. Our bow hunting guide service is an extension of the early years of being around Bear Archery and the laid-back legendary Fred Bear. Bob Jr's father, Bob Sr., worked for Fred Bear for nearly 30 years. His love of bow hunting and the outdoors had a profound influence on Bob Jr. and the tradition is carried on. With over 40 years of bow hunting experience, real insights exist to the best public and private properties for hunting. Both tree stands and ground blinds are available, along with "select" float trips for hunting Big Bucks. From riverbed areas to cedar swamps to oak ridges and jack pine forests, we offer great variety and opportunity to harvest a trophy. For an adventure in bow hunting not soon forgotten, join the Old Au Sable Bow Hunting team in Crawford County. Contact Bob at rcsmock@live.com or call (989) 350-7929.